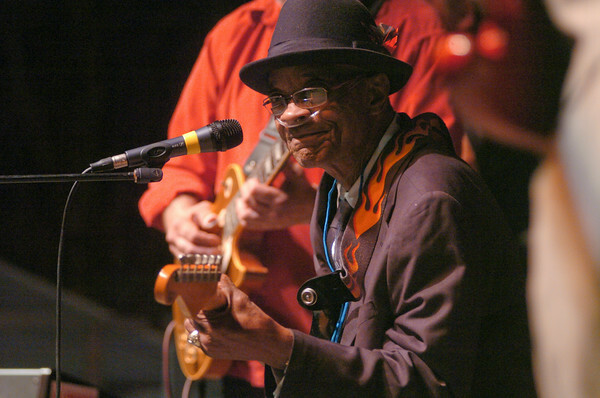 DAN CAPPELLAZZO/STAFF PHOTOGRAPHERNiagara Falls - Chicago blues legend Hubert Sumlin is all smiles as he performs “Sittin’ On Top of The World” during the Third Annual Niagara Falls Blues Festival on Old Fall Street Saturday evening. Sumlin was joined by 97 year old legend Pine Top Perkins, on piano and Steady Rollin’ Bob Margolin,on guitar, formerly with the Muddy Waters Band, and Matt Guitar Murphy, who was part of the original Blues Brothers Band as well as legendary harmonic master Willie “ Big Eye” Smith. Mayor Paul Dyster, an avid fan of the blues, introduced the headlines proclaiming that Niagara Falls had taken back September 11th from the terrorists and given to the positive power of the blues. Hundreds packed Old Falls Street to see and hear these legends of American music, one would have to think that it will be the last time Perkins and Sumlin will perform live in the Cataract City if at all. Sumlin played on Howlin’ Wolf’s mid-60’s Chess Record recordings.